“Put simply, this Pasta Evangelists box is an authentic taste of Italy. The box contains all the ingredients you need to create a delicious pasta meal for two. The box can be purchased as a one-off - which is great as a trial before you commit - or as a regular delivery for yourself or gifted to a friend. As a self-confessed foodie with a particular passion for pasta, I couldn’t wait to get my hands on one of these boxes. The promise of authentic dishes, crafted by hand with Italian-sourced ingredients sounded heavenly, and I waited with eager anticipation for my first delivery. What also appealed about this meal box was the promise of simplicity and ease of cooking each meal, with the comforting assurance of eating fresh authentic food that you'd usually only ever experience in an actual Italian restaurant! When the postman arrived on my doorstep, I was greeted with a simple, yet inviting brown box - proudly emblazoned with the Pasta Evangelists logo. 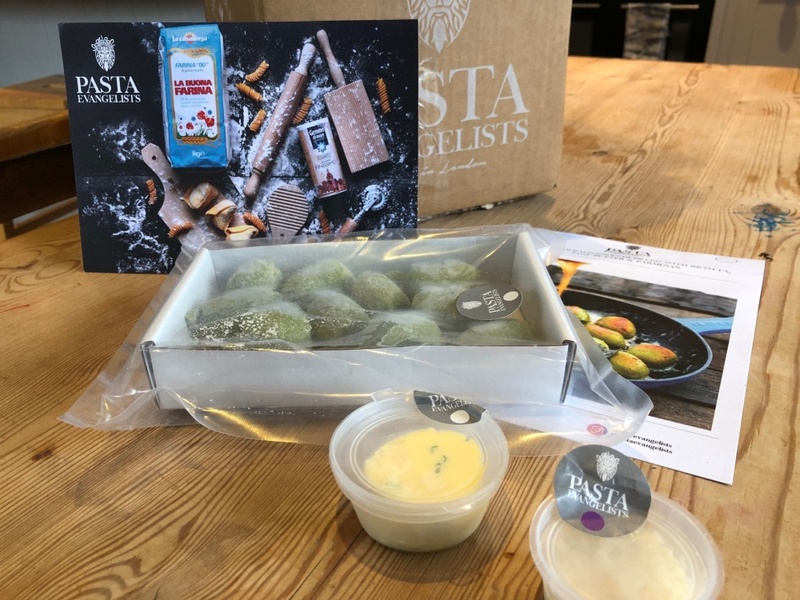 The delivery box was well designed internally, with the two meals kept fresh and arriving in perfect condition with insulated packaging and ice packs. So far, so good. This month's chef's selection recipe was giant emerald gnocchi filled with ricotta, sage butter and parmesan - gnocchi is one of my all-time faves, so this certainly brought a smile to my face. Digging into the box, all the ingredients were packaged individually and labelled. There was a clear recipe card with a photo of the finished dish for reference. The instructions were simple to follow and the meal was ready to eat within 10 minutes! With a 3-day shelf-life for both meals, it allows you to be flexible with your weekly meal plans and if it's not convenient to cook that week you can also freeze everything for up to two months - which is handy to know with busy, ever-changing weeknight plans often impacting meal plans. My giant emerald gnocchi meal tasted amazing and despite not being the best cook in the world, I was delighted that I still managed to re-create a dish which took me back to my Italian summer holiday. In my experience, you do really get what you pay for with food boxes, and the high-quality ingredients really stand out with this one. The one-off vegetarian box is priced at £16.40 for a 2 meal / 2 person pack. If you’re a serious foodie and love pasta this is perfect meal choice. The quality of the ingredients warrants the price as sourcing these would be nigh on impossible. You’re not buying a box of pasta, you’re buying an authentic Italian tasting experience. For those people looking for a value pasta meal, this is not the box for you. This will appeal to those foodies who are interested in food provenance and quality ingredients but don’t mind paying a bit more to experience it. Although mine was a one-off box, I would definitely consider this as an option as a regular subscription delivery or will give as a gift to one of my foodie friends. Overall I think this is a box that delivers on its promise. If you’re into your food and quality ingredients Pasta Evangelists are definitely worth a try." A one-off vegetarian recipe box of handmade Italian pasta and sauces delivered directly to your door. Create a sumptuous meal for two in 5 minutes!